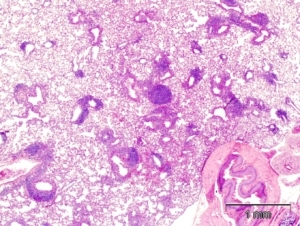 Model of Murine Hypersensitivity Pneumonitis - Comparative Biosciences, Inc.
Low and high magnification of multifocal chronic pneumonitis with hyperplastic bronchial lymphoid tissues throughout lungs of mice. 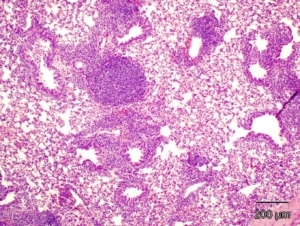 Farmer’s Lung is a hypersensitivity pneumonitis induced by the inhalation of biologic dusts coming from hay dust or mold spores or any other agricultural products. It results in a type III hypersensitivity inflammatory response and can progress to become a chronic condition which is considered potentially dangerous. Type III hypersensitivity occurs when there is accumulation of immune complexes (antigen-antibody complexes). Murine models of pulmonary hypersensitivity and inflammation are important for the assessment of novel therapeutics and diagnostics, as well as for the study of disease pathogenesis. 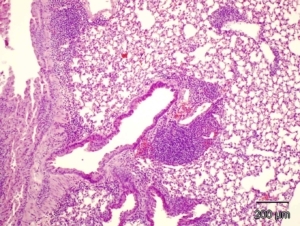 CBI has developed and validated a murine model of hypersensitivity pneumonitis (“Farmer’s Lung”) induced by the organism Saccharopolyspora rectivirgula. In this model, the repeated intrapulmonary introduction of S. rectivirgula induces a robust, uniform and marked inflammatory response in the lung characterized by large multifocal chronic granulomas throughout the lung and hyperplasia of the BALT.